Eddy Planckaert (b. Nevele, 22 September 1958) is a former professional road racing cyclist from Belgium. 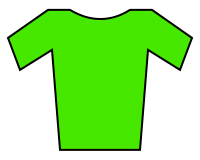 In 1988, Planckaert enjoyed perhaps his best year by capturing the green jersey (points competition) at the 1988 Tour de France and winning the Tour of Flanders. In 1990, he won Paris–Roubaix, his second monumental classic, with the closest finish in the race's history beating Canadian Steve Bauer by less than a cm. More than 10 years after his cycling career, the former racer got back into the public eye with a long running reality TV show about his family life, on Vtm. Eddy is the brother of fellow cyclists: Willy and Walter Planckaert. Eddy is also the uncle of Jo Planckaert and the father of Francesco Planckaert. After the 2016 Paris-Roubaix, Planckaert declared that second-placed Tom Boonen should have made a deal with eventual winner Matthew Hayman in order to fix the race and let Boonen win. ↑ Birnie, Lionel (5 April 2010). "Cycle Sport's Classic Race: 1990 Paris-Roubaix". Cycling weekly. Retrieved 23 April 2012. ↑ Clarke, Stuart (29 April 2016). "Tom Boonen should have made a deal with Mathew Hayman to win Paris-Roubaix, says former winner". Cycling Weekly. Time Inc. UK. Retrieved 30 April 2016.